Anyone who has worked in a large company knows what it is like to wait a half-day for a new computer from the IT department while the IT technician reloads all the applications and settings onto that new computer. Intel IT has changed all that. Intel employees can now get a new PC any time of the day or night, and within an hour have a fully configured and personalized PC with all the standard ...IT-supported apps, as well as their personal data, installed. • Delivery of PCs using “Grab-and-Go” lockers stocked with the most popular models and platforms, accessible around the clock. • The use of a simple self-setup process and cloud-based services to create a seamless user workspace that follows a user from one device to another. • Users can choose when to pick up their new PC, when to configure it, and when to turn in their old PC. Plus, they can perform self-setup using either a wired or a wireless network connection. • IT staff no longer have to spend hours migrating a user’s data, applications, and settings to a new PC, which lowers IT expenses. 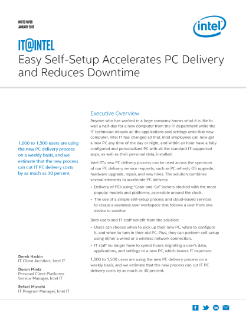 1,000 to 1,500 users are using the new PC delivery process on a weekly basis, and we estimate that the new process can cut IT PC delivery costs by as much as 30 percent. AI and HPC Workload Convergence running on an Intel®-based HPC infrastructure can accelerate your innovation. Intel VP Steve Sciarappo talks about how Intel is driving digital business transformation across our supply chain. Intel VP Amy Warner discusses Intel’s own enterprise digital transformation from a PC-centric to a data-centric company. What Are the Hybrid Cloud Adoption Drivers?